In the beginning of April, The National Institute of Heritage has settled the first competition of the subsidy program Volunteering for Heritage. 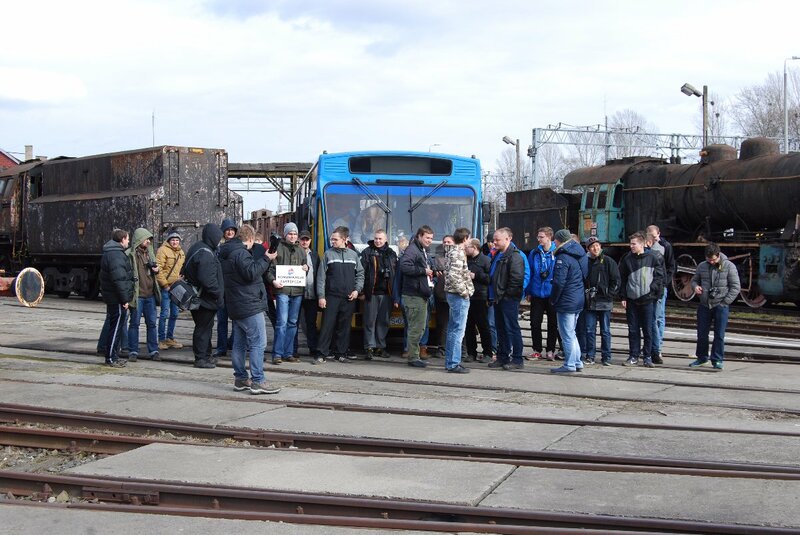 The project of our Association Technical Education as a promotion of volunteering for railway heritage in Skierniewice Engine Shed was appraised very high and will receive the required support. The last thing to be done is to complete the documentation required for signing the agreement. The project is intended to surpass the multiple obstacles which discourage new people in volunteering in railway heritage renovation works. We will publish the details of the project soon. 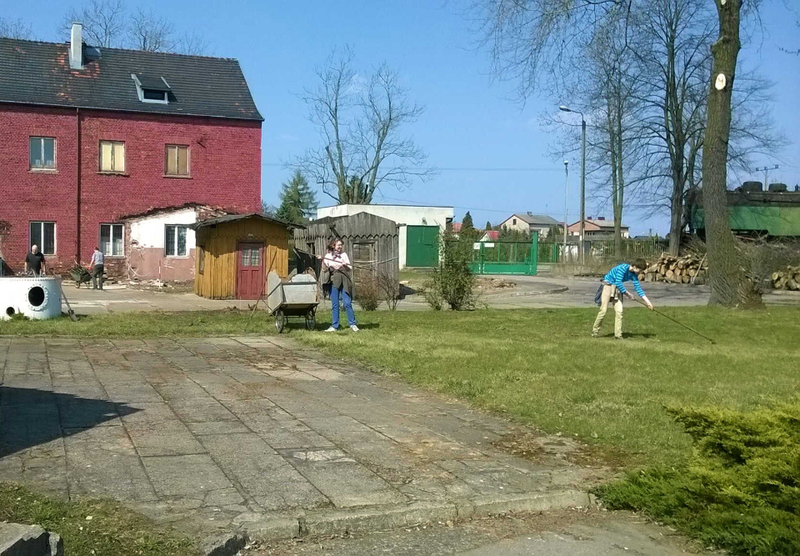 We would like to inform you that the Ministry of Internal Affairs and Administration approved and registered a collection (application No 2016/1054/OR) organized by PARE for revitalization of Skierniewice Shed and its collection. The collection will be conducted to the collection boxes in the premises of Skierniewice Shed. We would also like to encourage you to devote your 1% of income tax to PARE or donate directly to our bank account 52 1240 6218 1111 0000 4617 3535 (PeKaO S.A.). The best wishes of happy and blessed Easter! During the planning of events for 2016 we were estimating some of the days of the common celebrations across the Poland taking into account the past agreements. 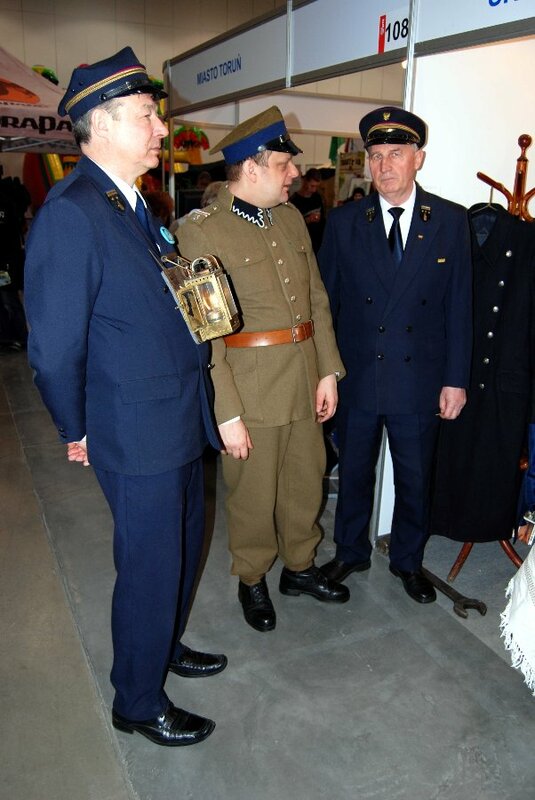 Sometimes this may prove troublesome – this is why we were surprised that Night of the Museums, which traditionally took place on third weekend of May will be moved to later term. So due to the reasons independent of us, to keep pace with the common event coordinated by the City Council of Skierniewice, we will postpone the Railway Night of Museums to 14th May. Another change is more positive and regards adding new event on 7th May – the Evening in the Shed. At 8PM we would like to invite you to the presentation by Dr Ariel Ciechański and the accompanying discussion regarding the approach to organizing railway museums – a choice between modern and genuine. The meeting will be a part of the Educational Workshop sponsored by BZ WBK Foundation. In the middle of March we have signed one more subsidy agreement. City Council of Skierniewice in open submission granted us 6500 PLN for realization of task Adaptation of historic buildings for museum or cultural purposes. 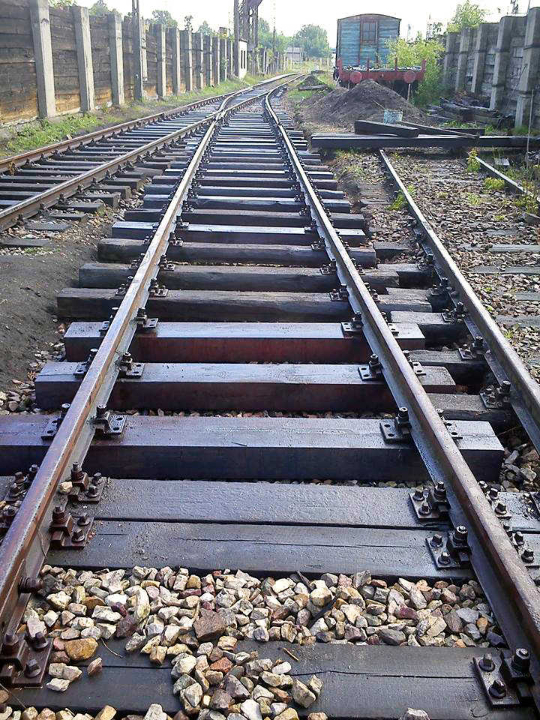 Together with the own capital of 1625 PLN it will be devoted for the most urgent track repairs in the Shed. Still, the amount is lower than we expected, so most of the works will have to be conducted with our own forces. After receiving the money, but before starting any actual works, we will have to buy the required track materials and just then we will be ready for regeneration of the most damaged parts of the Shed’s track layout. The works will start probably on the turn of May and June, but we would already like to invite the volunteers to help. 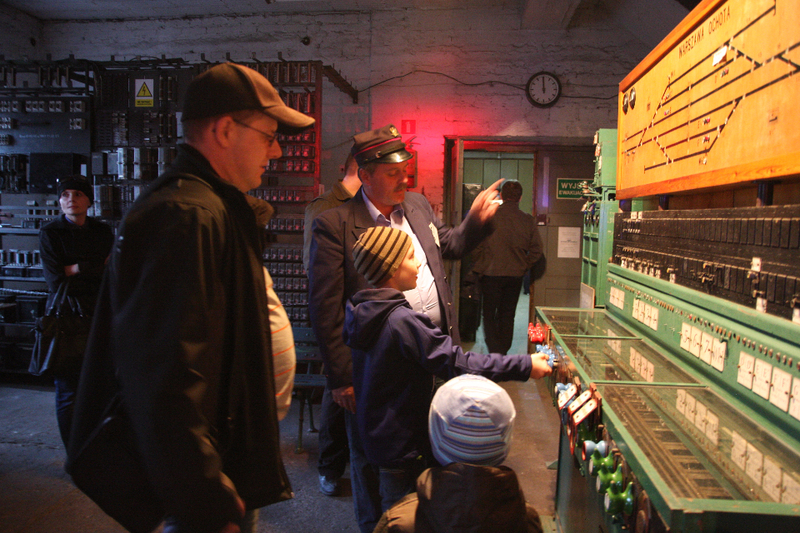 In principle, the Engine Shed is not accessible to tourists outside the season, nevertheless we always try to respond to the requests of organized groups. Quite a common guests are the fans of vintage car or road vehicles. On Saturday, 19th March, the Shed was visited by the first such group this year. During the event “Time for Mig”, about 50 enthusiasts of city transport took a trip along the roads of Skierniewice and nearby towns in two vintage buses. 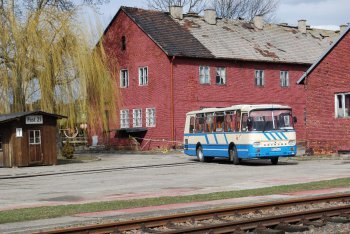 The background for the excursion were the railways surrounding Skierniewice, and the main attraction – one of the oldest buses of Skierniewice mass transit operator (MZK) – Jelcz M11 (nicknamed “Mig”). According to the organizes, this vehicle (number plate ES 03213) from 1988 is one of the few of its kind still in working order. Jelcz buses arrived on the Skierniewice roads, dominated by Autosan H9-35 types, in late 1985 with the first models PR110. Soon the modernized model M11 also appeared here. 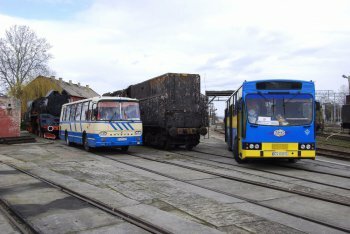 The main attraction of the event is cruising the roads of Skierniewice without any relocation to other towns since it left the Jelcz factory. March is the beginning of struggle with tax settlements, therefore we would like to encourage you to share your 1% of income tax to our Association. As in the previous years, collected money will be turned into the initial capital required when applying for public subsidies. We already managed to successfully apply for four subsidies. Part have been already paid to Association’s account, part waits for the final signatures and part requires a couple of last documents to finish the procedure. 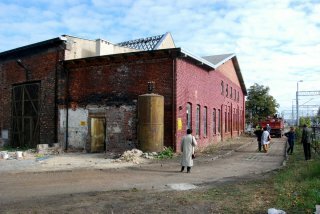 Two most important subsidies are sponsored by the Ministry of Culture and National Heritage and will be devoted for the repairs of another 612 square meters of roundhouse roof and first stage of skylight rebuild. Unfortunately, the required initial capital is much higher then we expected. For the 190 thousand PLN applied, we need 47 thousand PLN of own capital. Nevertheless the amount will let us bring to the end the repairs of roundhouse roof leaving only the skylight to be completed. First subsidy of the Ministry (90000 PLN) for the task Skierniewice Engine Shed – roundhouse (19th century): continuation of rebuild of damaged roof (stands 15-23). The task includes repairs of another part of main Shed building over the stands 15 to 23 (total area of 612 sq. m). 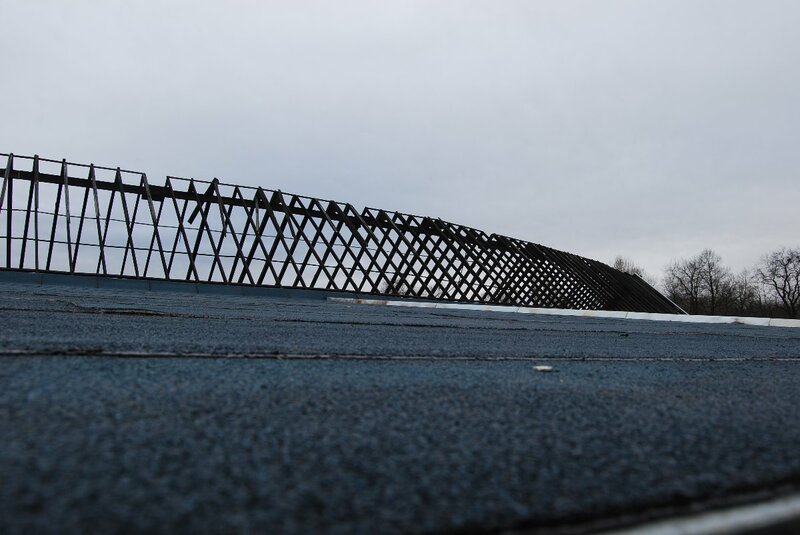 The repairs requires a complete replacement of wooden parts of the roof and laying a double layer of felt. 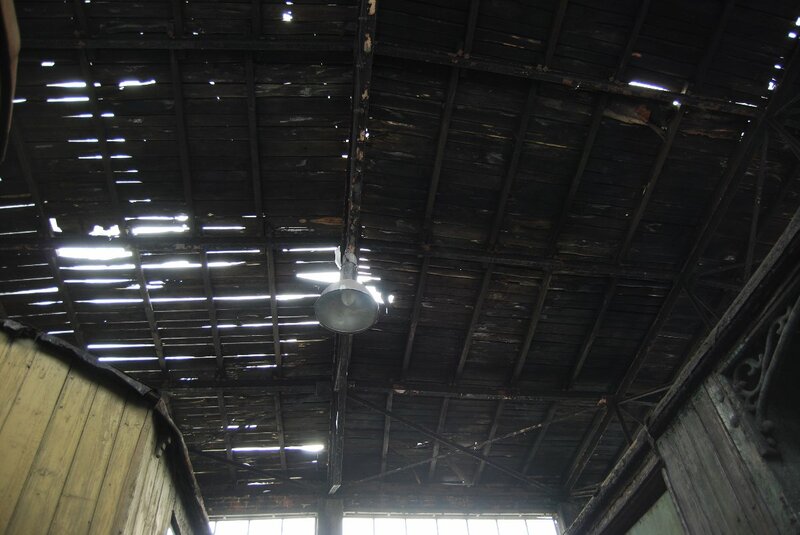 Second subsidy of the Ministry (100000 PLN) for the task Skierniewice Engine Shed – roundhouse (19th century): continuation of rebuild of damaged roof (skylight over stands 1-3). For the first time we will be able to repair the large skylight spanning the whole length of the roundhouse. 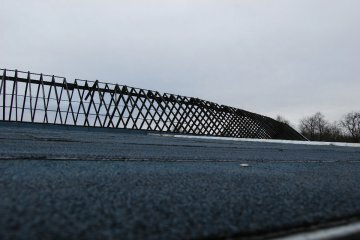 Thanks to that, the roof over stands 1 to 3 will be complete (this part of the roof underwent overhaul in the previous years). We are especially happy that the most precious exhibits from our collection (especially the battery unit Wittfeld) will be protected against the rain and snow. We also received the subsidy from City Council of Skierniewice. We were granted 6500 PLN (required initial capital 1625 PLN) for the task Adaptation of historical buildings for museum and cultural purposes. This amount will be devoted for the tracks relaying within the premises of Engine Shed. Another subsidy, sponsored by BZ WBK Bank Found, will be devoted for Technical Education Workshops (we write more about that here). Totaling, we still need over 50000 PLN of initial capital, and there are new subsidy applications to come. We also encourage various institutions and companies to help us collect the required money. We have a new offer directed to youth in age from 15 to 26 years. Thanks to the support of the project Technical Education as a promotion of volunteering for railway heritage in Skierniewice Engine Shed by BZ WBK Foundation young people can once again take part in common project. By learning new technical skills, participants will help in rescue of unique historical railway stock. A great convenience for participants of the project will be the refund of costs of travel to and from Skierniewice. We start at the turn of April and May. We will inform in advance about the precise dates of meetings and their topics. 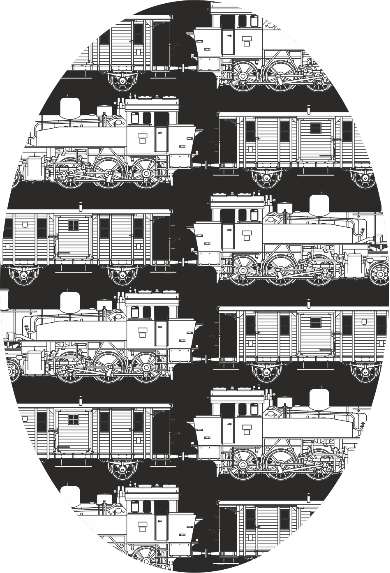 We can already tell that except the practical activities, we plan to conduct lectures regarding the outline of railway history and methods of restoration of historical rolling stock. 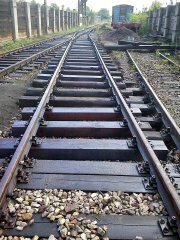 A technical training in theory and practice will be performed during the actual renovation works. This will include metalworking, carpentry and painting. We especially put emphasis on teaching the safety rules of power tools usage. Despite there are still two month to the first session of the Workshop, we already encourage all interested to contact us at wolontariat@psmk.org.pl. 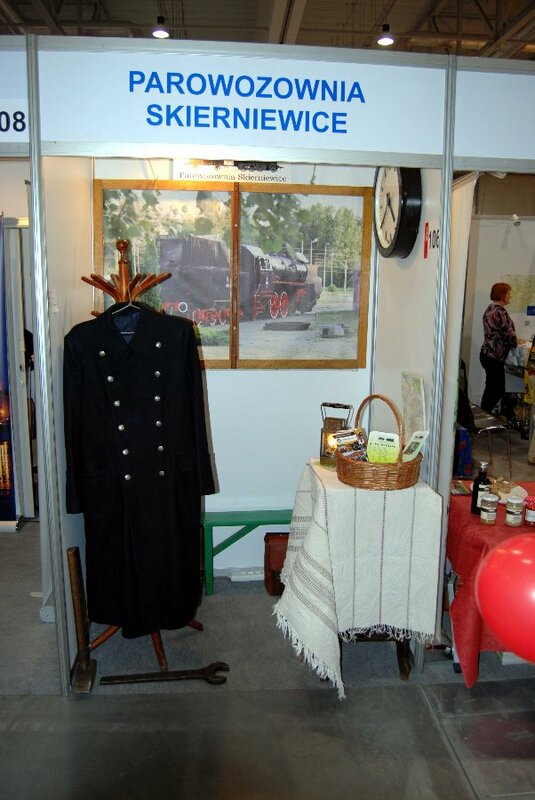 From 26th to 28th February, as each year, we participated in touristic fairs in Łódź – Where Cultures Meet – and promoted the value of the historical Depo in Skierniewice and its collection. One could meet our colleagues at Shed’s stand, talk with them about the oncoming touristic season and receive promotional leaflets with Open Days calendar. For us it was also the opportunity to refresh old and establish new contact. We hope that new acquaintances will result in interesting joint projects. During the last weekend (20th and 21st February) we started the long awaited stage of assembling of railway communication exhibition. 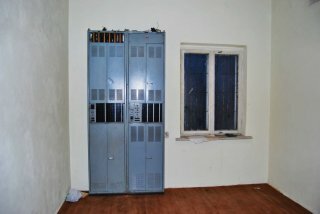 As the first exhibits two racks of carrier telephony of system 3×12 were mounted on their place. 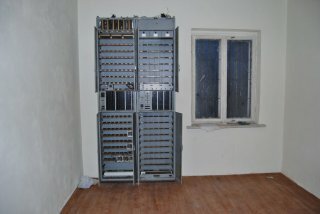 One is the telephone line terminating rack, second will contain the splitters. More racks wait for their turn. Nowadays, when digital technology dominated the communication, this type of equipment is nearly forgotten. However, it was a major jump in telephonic communication, allowing multichannel use of a single line, increasing its capacity and allowing for easier access to long-distance calls. In time of Warsaw-Vienna Railroad and the beginnings of Polish State Railways, in order to phone from Warsaw to Skierniewice (note, that it was the first telephone line in Poland, built only a couple of years after the first phone call made by A. G. Bell) plenty of resources were required. A single pair of wires (nearly 16 tons of bronze) was suspended over 1400 massive wooden poles by means of 2800 purpose-made porcelain insulators and over 3 tons of steel hooks and clamps. Despite the effort required to built the line, it allowed only one call at a time. If the capacity of line was to be increased, the amount of resources multiplied, giving enormous amounts of wood, steel and china. Fortunately, in the early 1930’s the first systems of multichannel telephony stopped the menace of hundreds of wires suspended on each telephone line and made a long-distance call much easier.